The heat is rising. As California battles another round of wildfires, and 2018 continues toward becoming one of the hottest years on record, a new study predicts that in the coming decades the United States’ heat problem will grow more dangerous and expensive. The study’s authors looked at how many people visited emergency rooms for hyperthermia, or overheating, in 136 metropolitan areas in the U.S. between the summers of 2005 and 2012, and projected how the number of ER visits for hyperthermia may increase under different climate scenarios. The study was published in GeoHealth, a journal of the American Geophysical Union. The U.S. National Weather Service posted heat advisories for much of the Northeast on Monday, 6 August 2018. Criteria vary, but generally local forecast offices issue advisories when the maximum heat index temperature is expected to be 100 degrees Fahrenheit (37.8 Celsius) or higher for at least two days, and night time air temperatures will not drop below 75 degrees Fahrenheit (23.8 Celsius). The USGCRP report focuses largely on the direct health impact of heat on death, not on heat-induced illness and its costs. The new study explores heat’s cost on health by focusing on hyperthermia admissions, and projects the coming change across much of the country’s metropolitan areas. 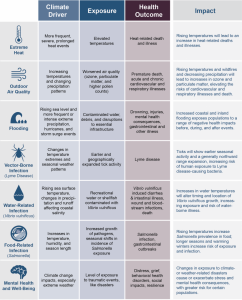 This table lists the various causes and ways in which climate change affects human health. Extreme heat, along with air quality and vector-borne infection, are just a few of the ways climate change inadvertently threatens human health. Click for larger view. Image credit: U.S. Global Change Research Program. — Brendan Bane is a freelance science writer based in Santa Cruz, California.